I have been in Toastmasters for a while now – well over 3 years and have completed the Competent Communicator manual. This is a series of different speech types that cover all the basics of improving your public speaking, such as how to organise a speech, how to use your voice to engage the audience better, to using different and vivid words to get your message across more clearly. The competent communicator series also starts to help you develop your powers of persuasion and give you practice in how to inspire your audience. As people work through the Competent communicator manual some club members also start to enter the speaking competitions that Toastmasters run. 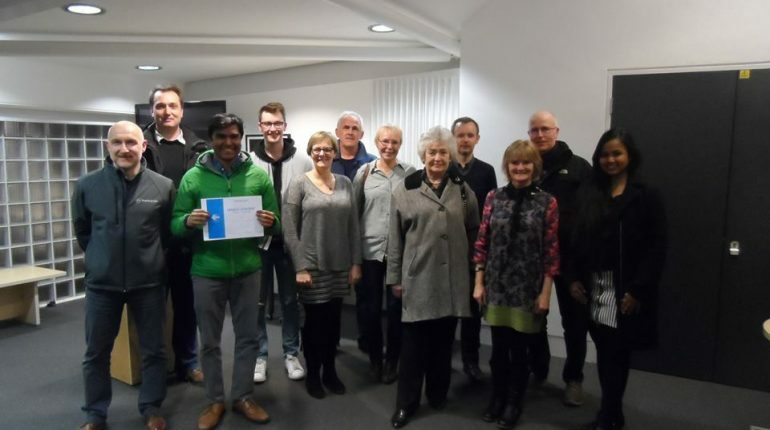 Each toastmasters club runs a competition for club members, and the winners go on to complete with nearby clubs (called areas) and if you win the area you can go on and compete in the district and so on. Here at the Perth TM club we compete with our nearest neighbours, Dundee, Aberdeen, Inverness and St Andrews. The round of speaking competitions that finished in May is called The International Competition because eventually if you keep winning you can compete at international level. As part of the International competition you can either enter a speech ( 5-7 minutes in length) or enter the evaluation competition where you provide a short ( 2-3 mins) critic of a speech delivered by an experienced speaker. Now I have to say I have always thought why on earth anyone would want to enter such a thing. Surely all that happen is you will feel more stressed about getting up and saying something in public. As a member of TMs you don’t have to enter but more experienced members in the club do tell me it is a beneficial experience – really??? So far I have not entered a competition but I can see the development it provides to those who do just dive on in there. The benefits are that without exception they start delivering better speeches and evaluations. They come across as more confident, clear and engaging. Club members do seem to come on in leaps and bounds once they have entered a competition – it’s a big boost to their speech giving and evaluation skills. “At the point I entered the evaluation competition I had only given three speech evaluations. To cut a long story short, I never dreamed of coming third place in the Scottish finals! The idea that entering competitions really does improve your speaking skills got me thinking, If I am serious about being a more engaging and confident speaker to large groups then maybe I should just enter the next competition!